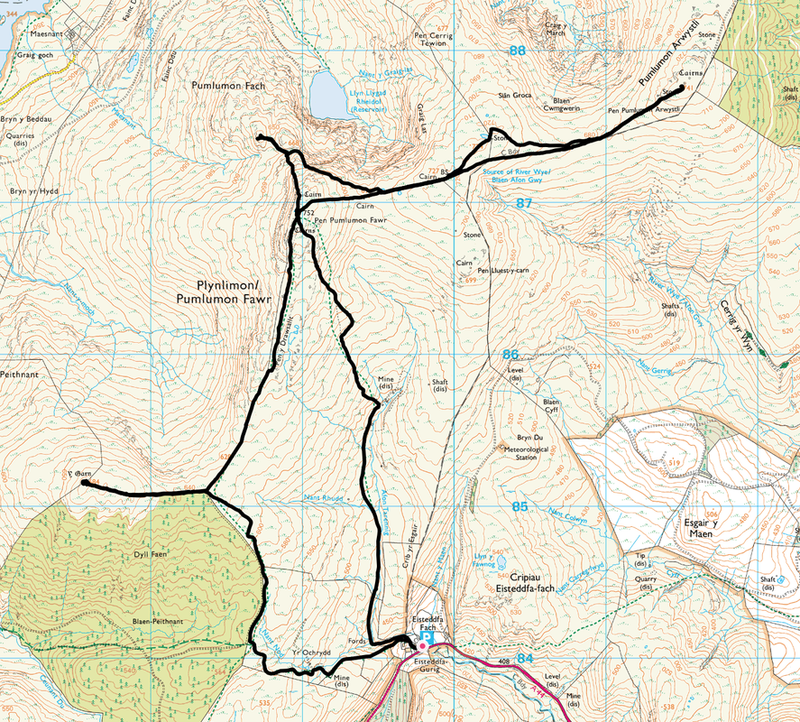 Farm tracks and mountain paths with some boggy sections. 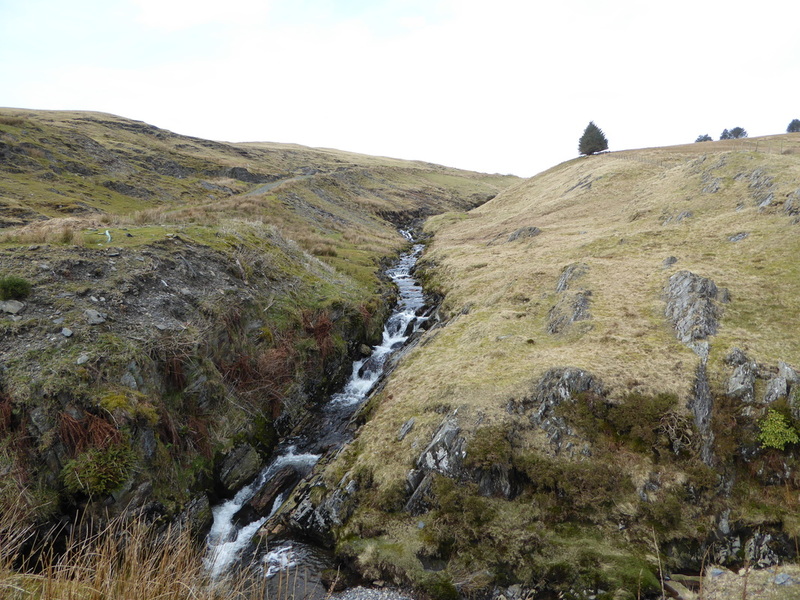 The path from Pumlumon Fawr to the old mine workings is intermittent. 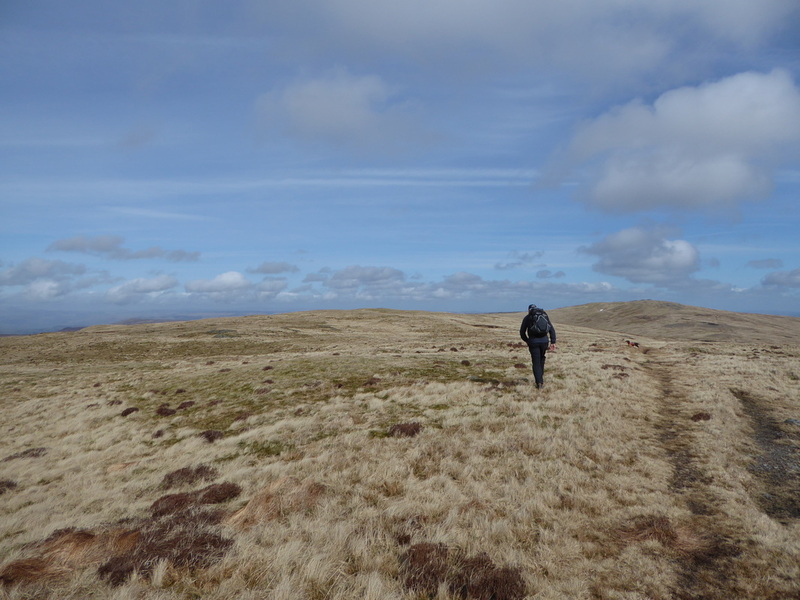 Good Friday therefore out in the hills nearer to home today. 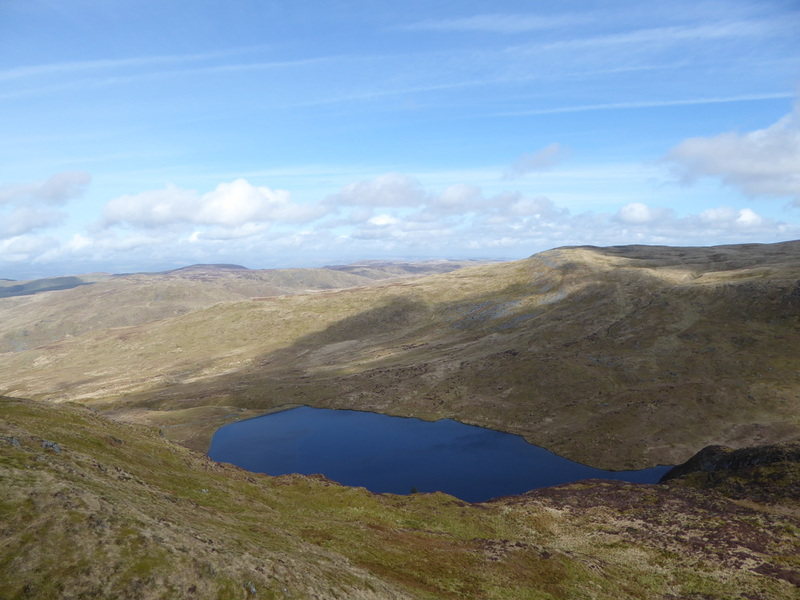 We made the 45 minute drive to the small hamlet of Eisteddfa Gurig which, along with Nant y Moch Reservoir is the popular start of any ascent of the Pumlumon range. 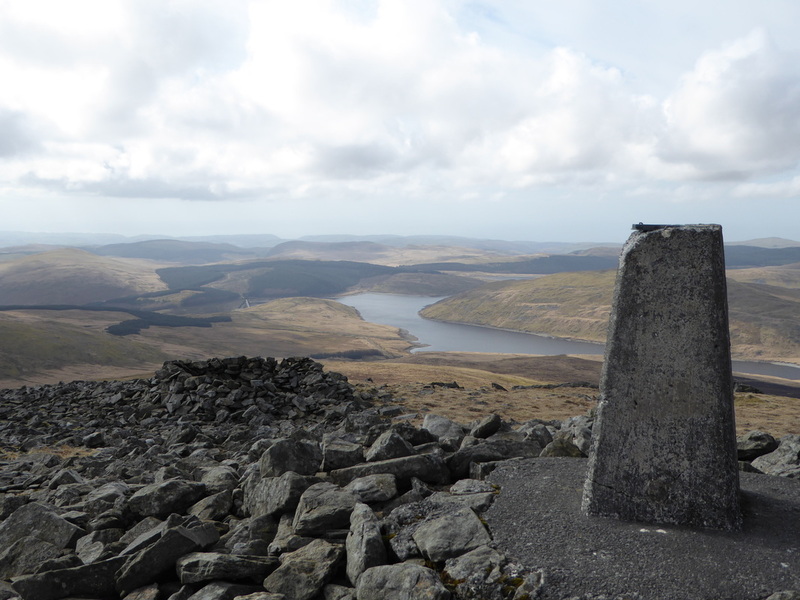 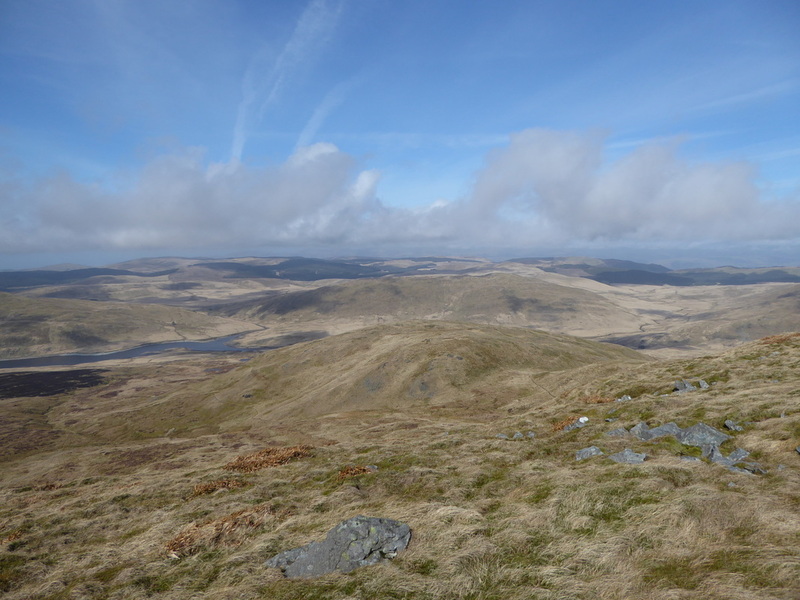 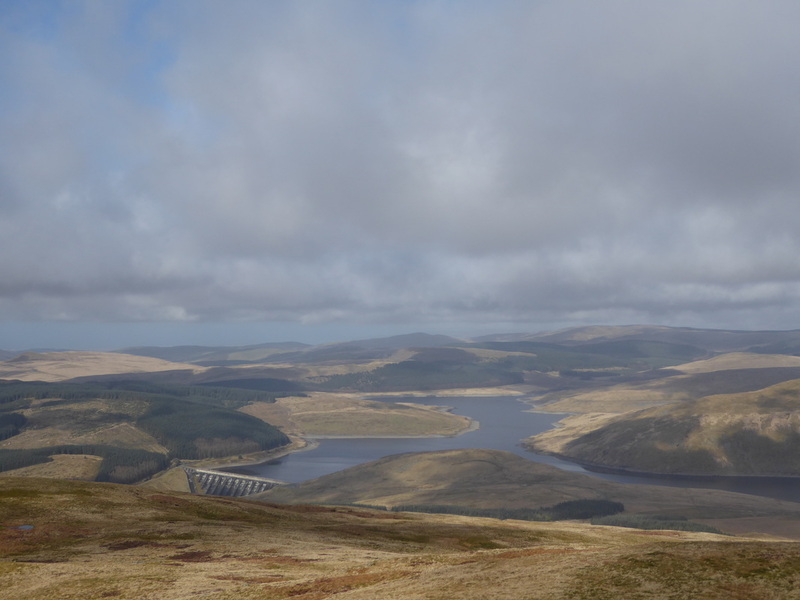 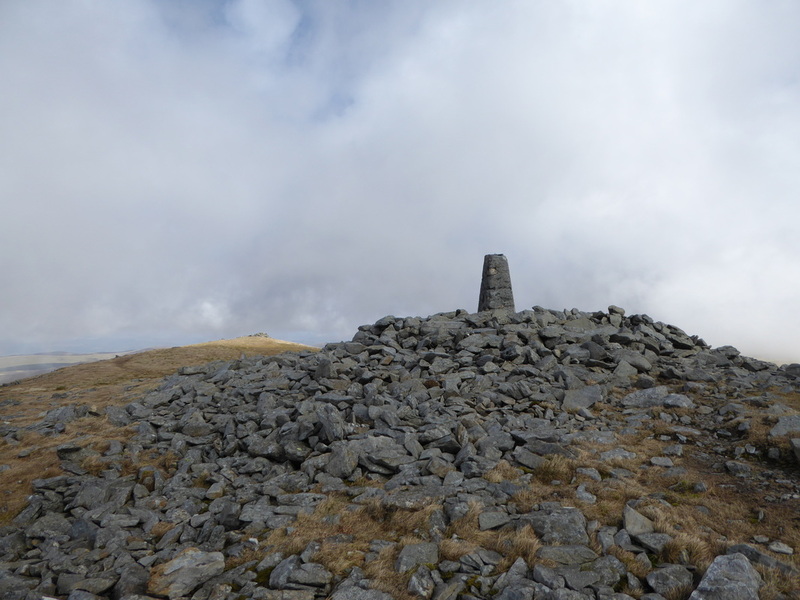 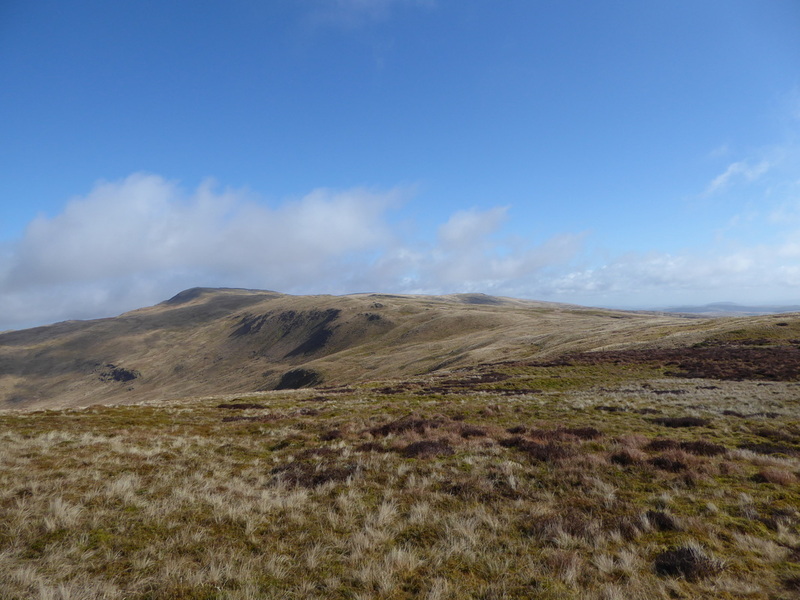 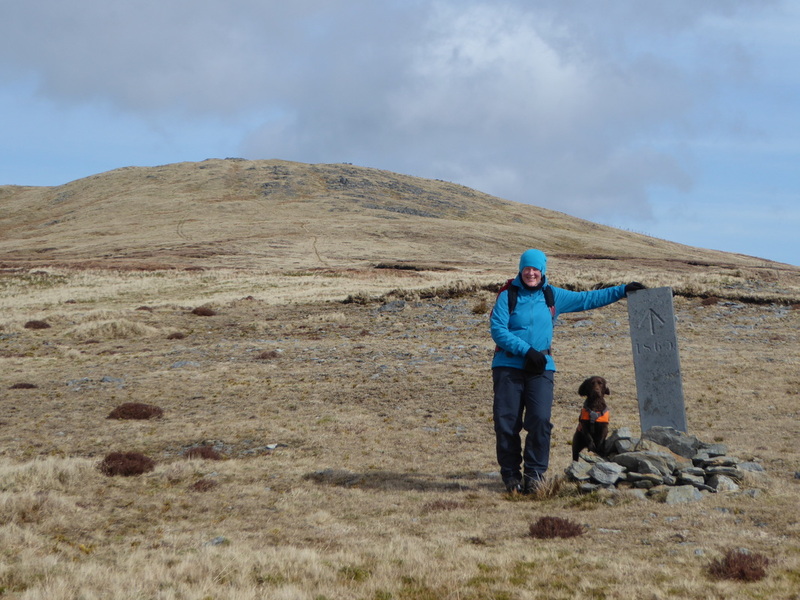 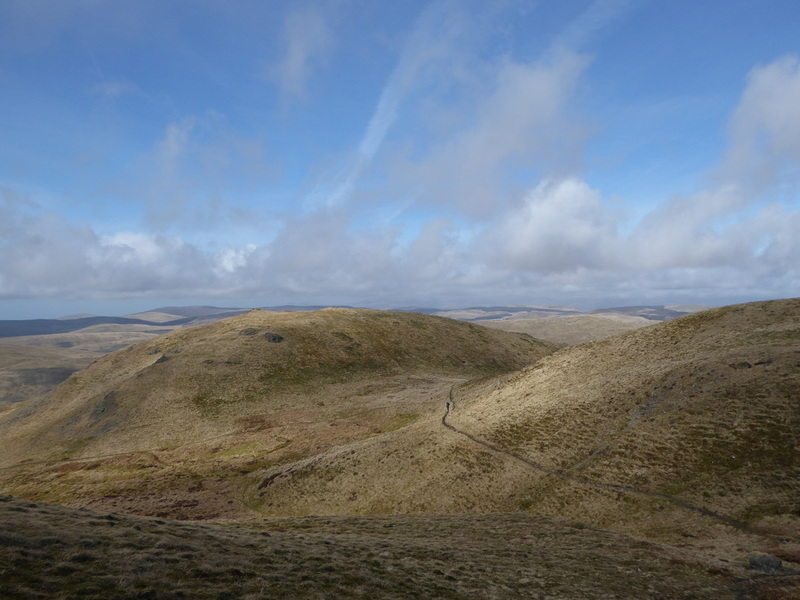 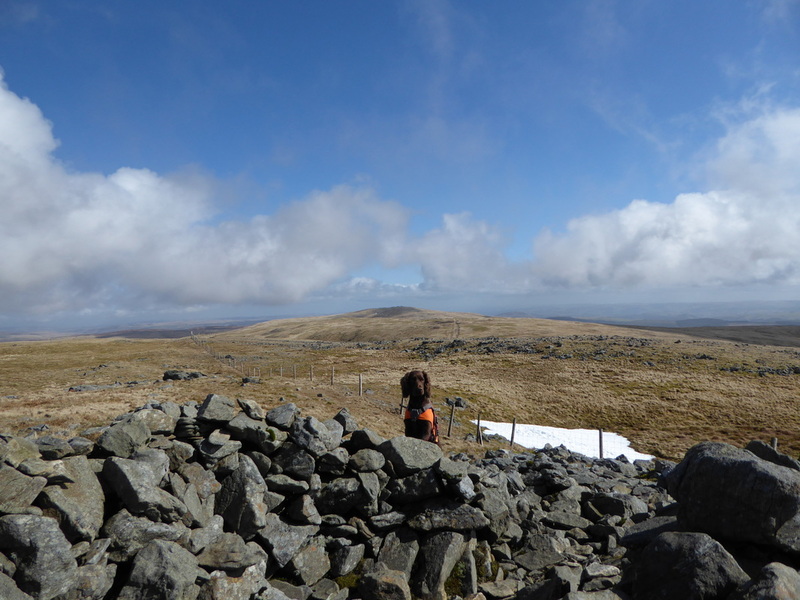 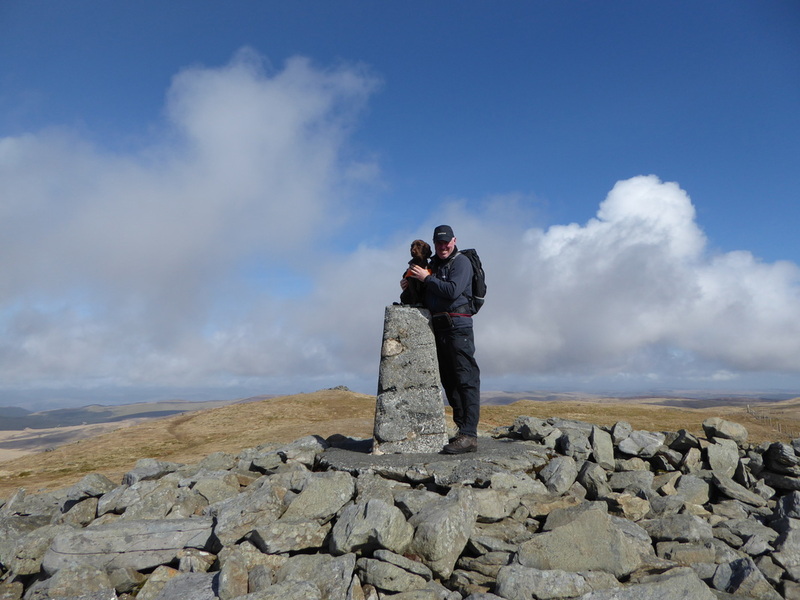 Pumlumon (meaning 5 peaks which are all Welsh Nuttalls) is the highest point in the Cambrian Mountains and Mid Wales. 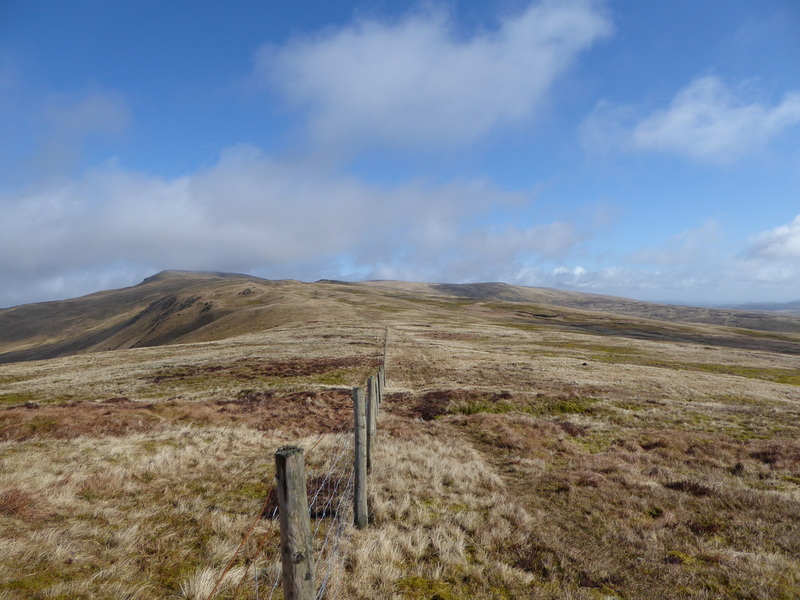 It is a massif that dominates the countryside of northern Ceredigion. 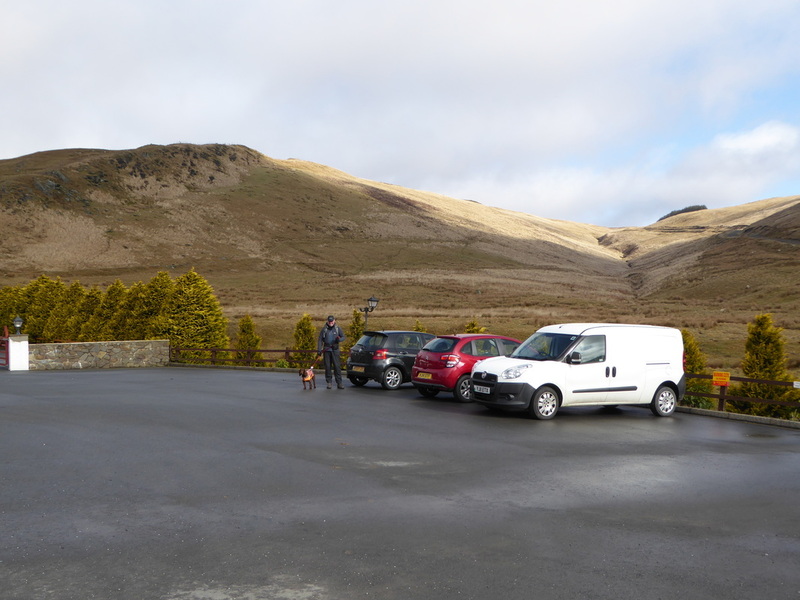 The walk began at the farm at Eisteddfa Gurig which has a large Car Park but be warned - they charge £5 for all day parking!! 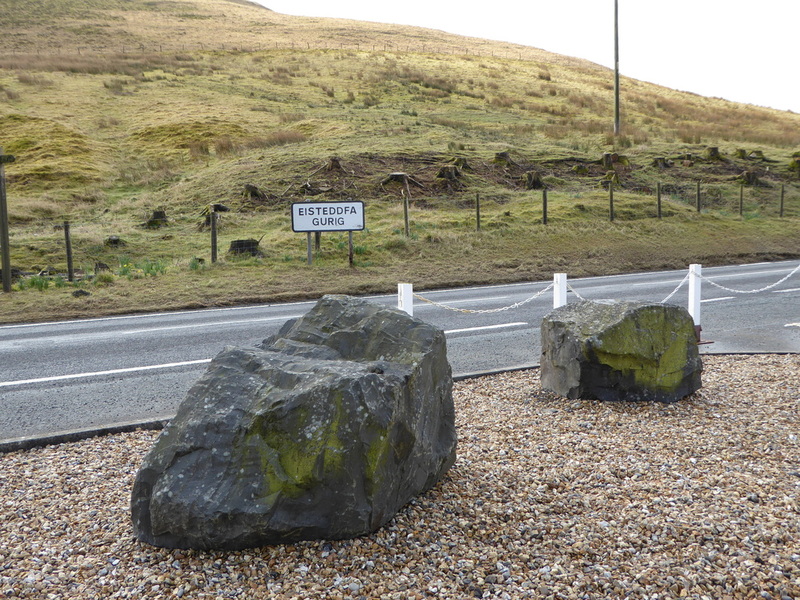 There is free parking further up the A44 if your pocket or conscience cannot take spending that amount! 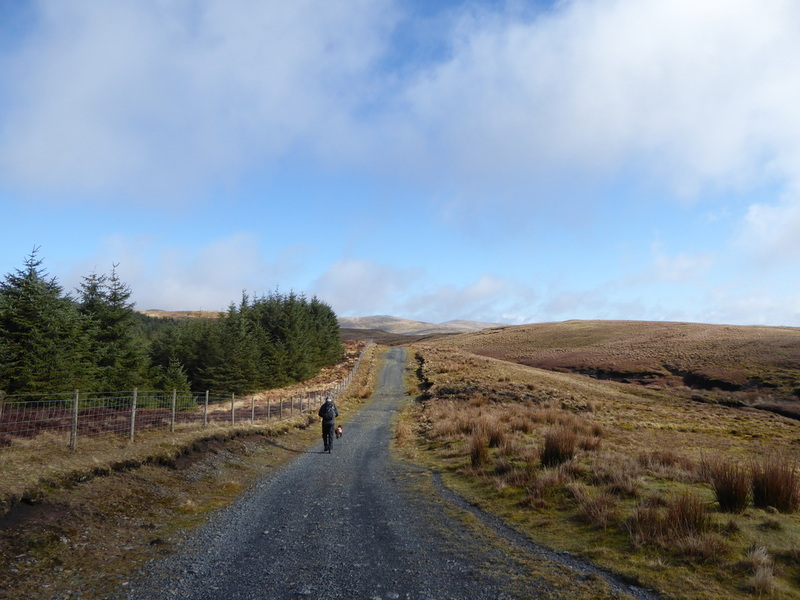 Leaving the Car Park, the route headed through the farmyard to emerge at a junction of paths. 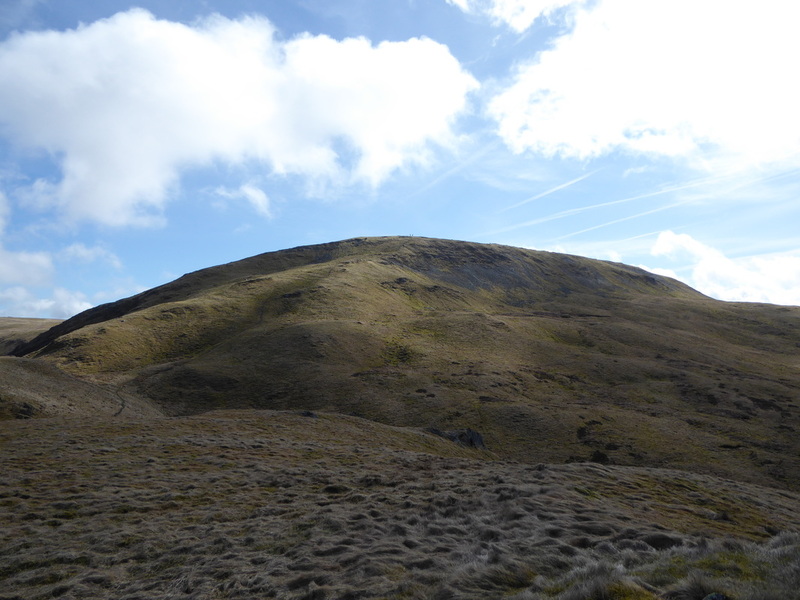 The left fork headed out on a good track which meandered its way gently up the hillside to reach the forest. 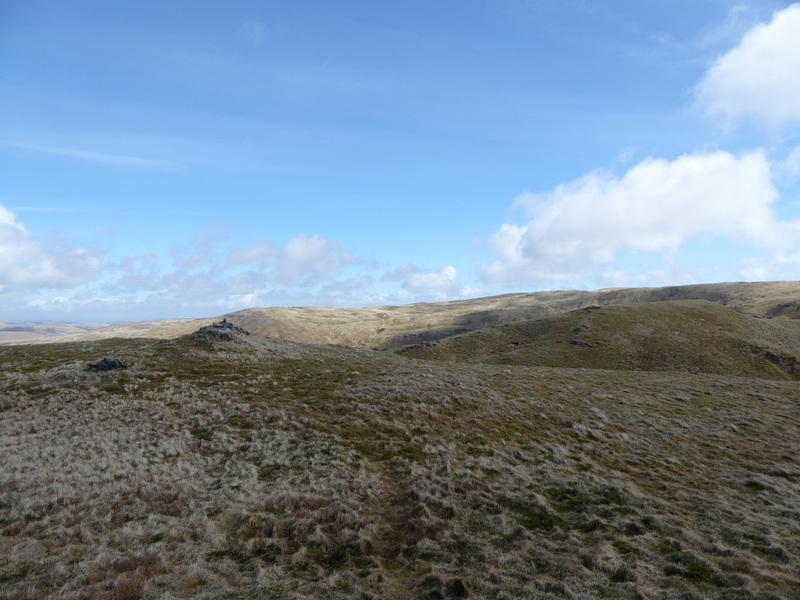 Turning to the north, the track continued, increasing in gradient until reaching the north eastern edge of Dyll Faen. 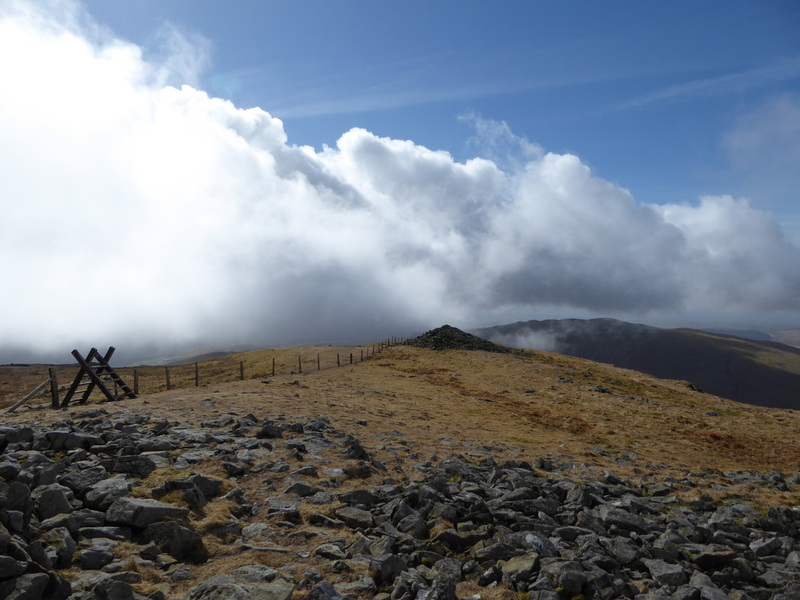 To reach Y Garn it was just a question of hand railing the forest fence to the west on an undulating grassy path to reach the large summit cairn which gave glorious views over Nant Y Moch, Drosgl and to Pumlumon Fawr. 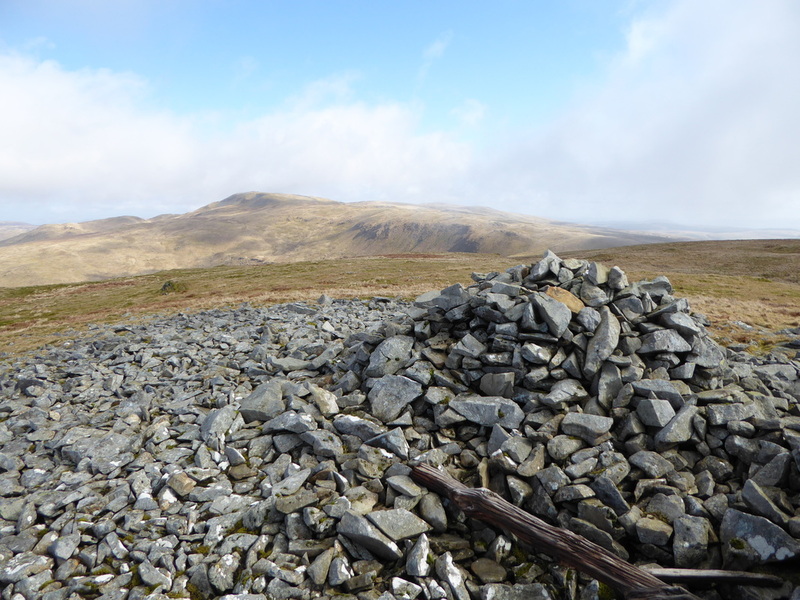 From Y Garn the route returned due east, along the same outward route before turning north once again to follow the right hand side of the fence to make the delightful transit up on to the plateau summit of Pumlumon Fawr with its many shelters and Trig Point. 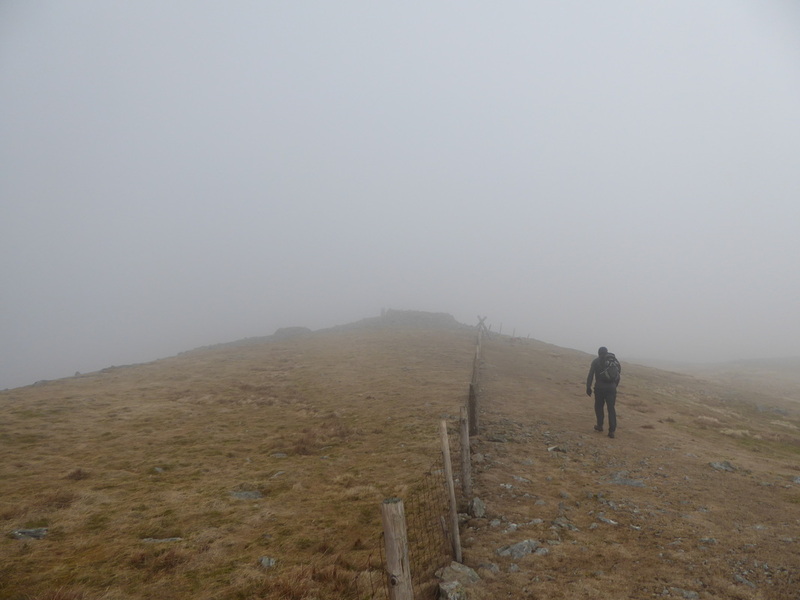 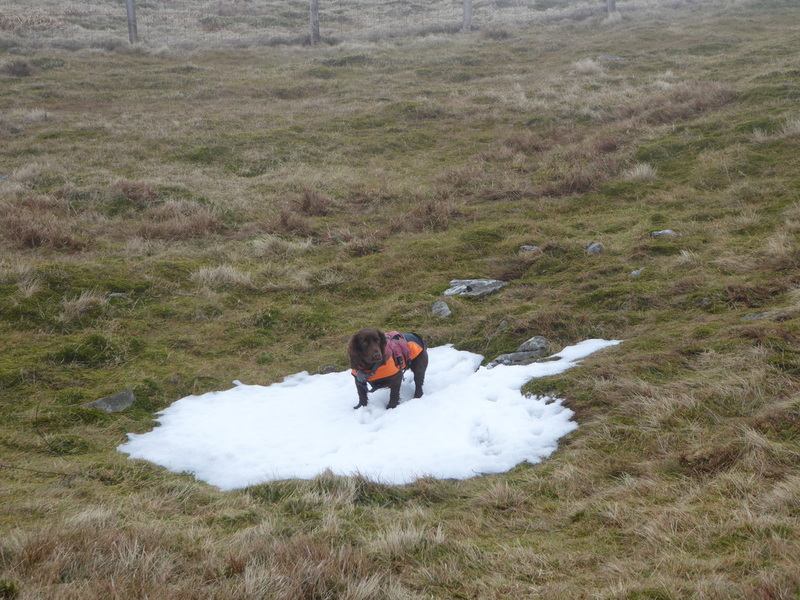 The next Nuttall of Pumlumon Fach would be difficult to find in mist however today was fairly straightforward. 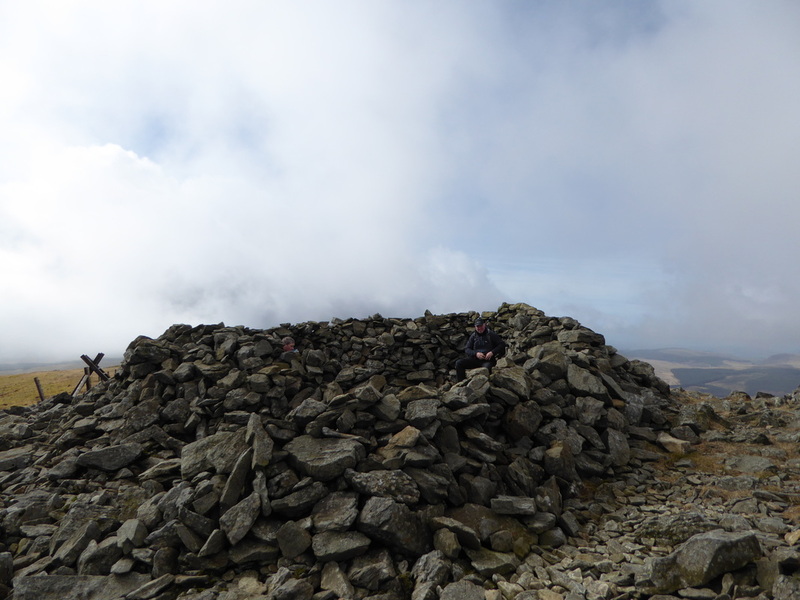 We had to drop down into a col and then take a path to the North West that rises to the summit where there is a small cairn. 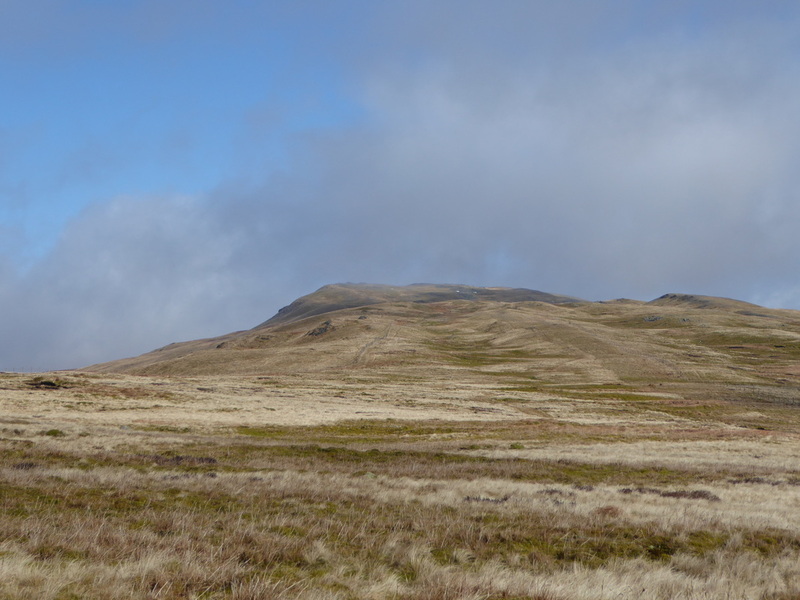 Leaving the top it would have been navigationally sound to return to Pumlumon Fawr and then be back on the ridge however we took a shorter route around the flank of Pumlumon Fawr, thus regaining the ridge just beyond the eastern cairn. 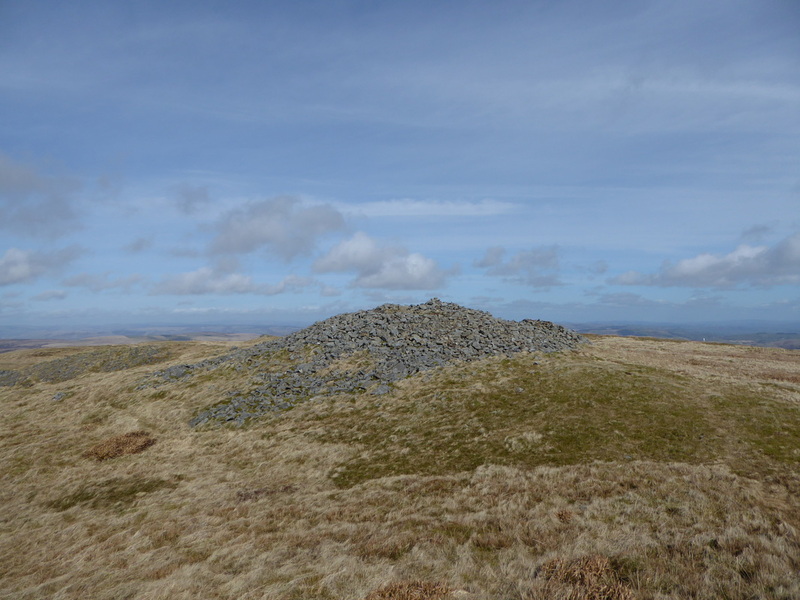 There was now a good path to the point where we would rejoin the path coming down from Pumlumon Fawr to reach the summit of Pen Pumlumon Llygad-bychan where there were good views to be had. 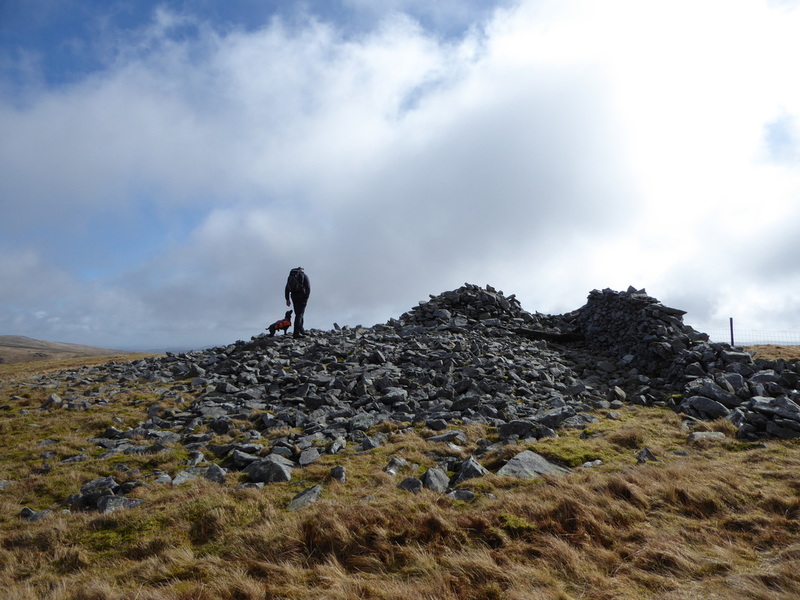 Leaving the summit, it was now a question of remaining on the path from Pumlumon Fawr in order to climb up to Pen Pumlumon Arwystli and its two large cairns although we deviated slightly to take in a subsidiary summit of Pen Pumlumon Llygad-bychan for more excellent views. 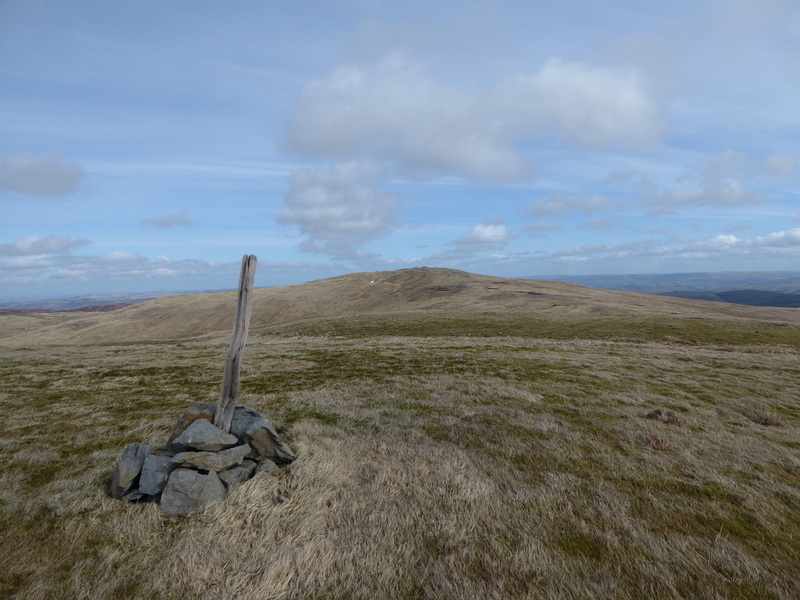 From the summit of Pen Pumlumon Arwystli we returned along the fence back to Pumlumon Fawr, crossed the stile on the summit and headed south. 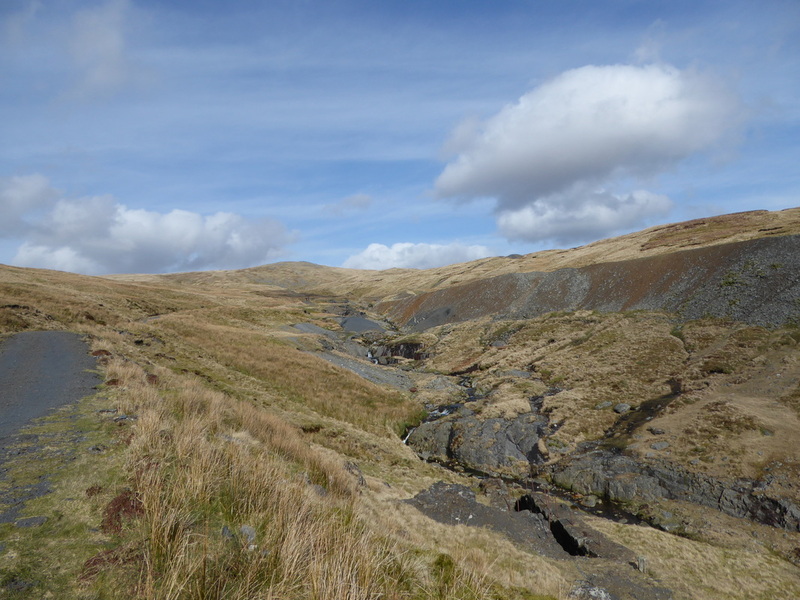 This path was cairned for about half a mile then became intermittent before petering out altogether therefore we took a bearing on the disused mine, descending over tussocky grass to reach a track. 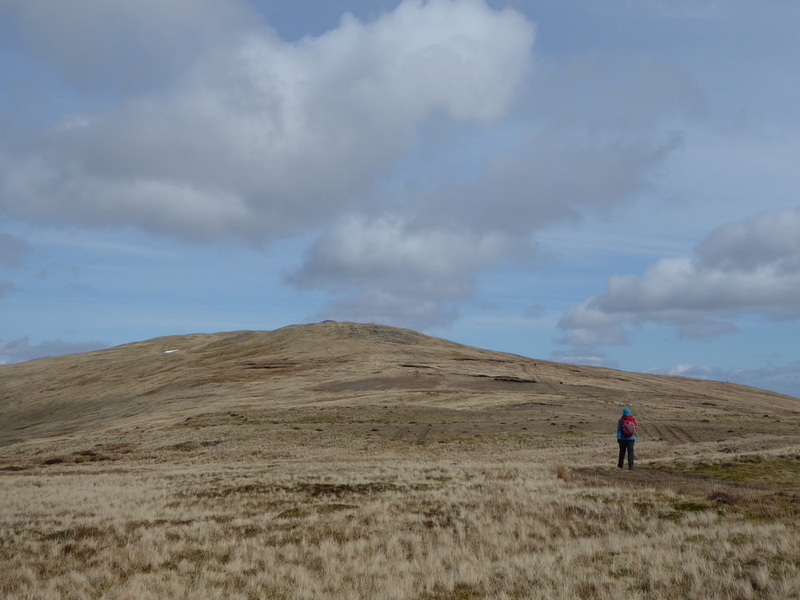 From here it was a simple case of following the track all the way back to the farm at Eisteddfa Gurig. 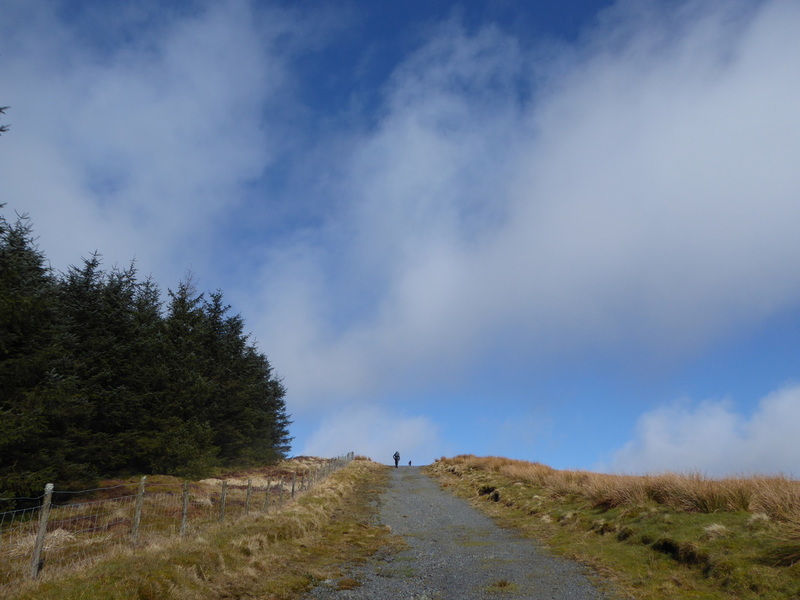 If you want solitude, good walking and superb views then Pumlumon is for you. 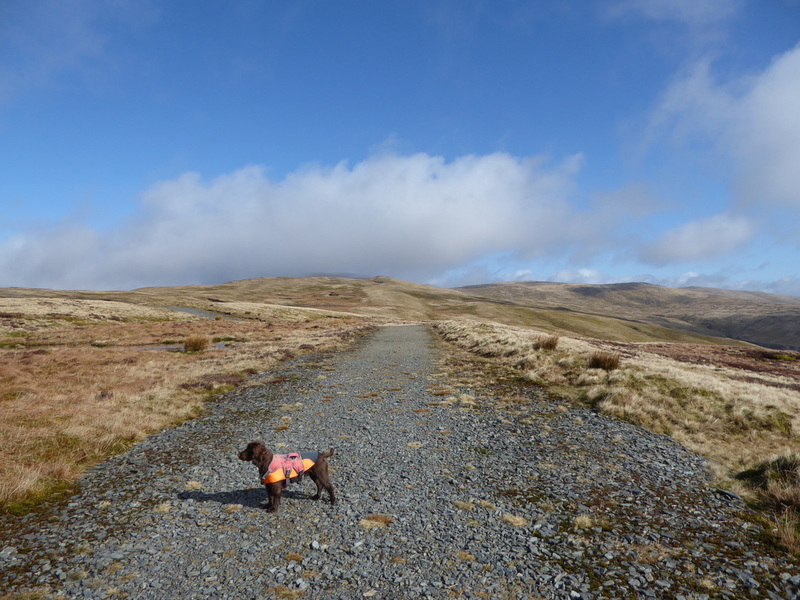 We have walked in this area a few times now and are still surprised at how quiet it is - even on Good Friday! 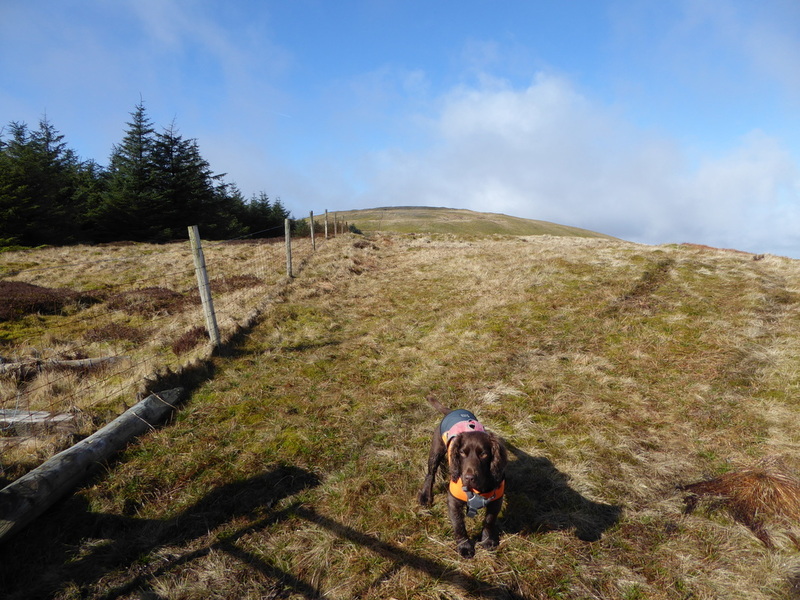 The track junction at the top end of Dyll Faen - carry straight on to Pumlumon Fawr (in cloud ahead) or head west where Fudge is pointing to! 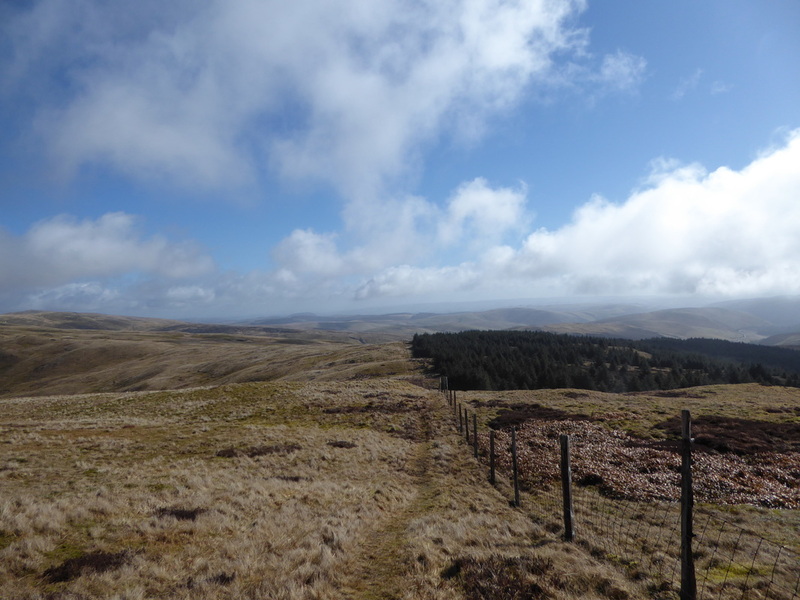 Back at the path junction and the fence that leads all the way to Pumlumon Fawr. 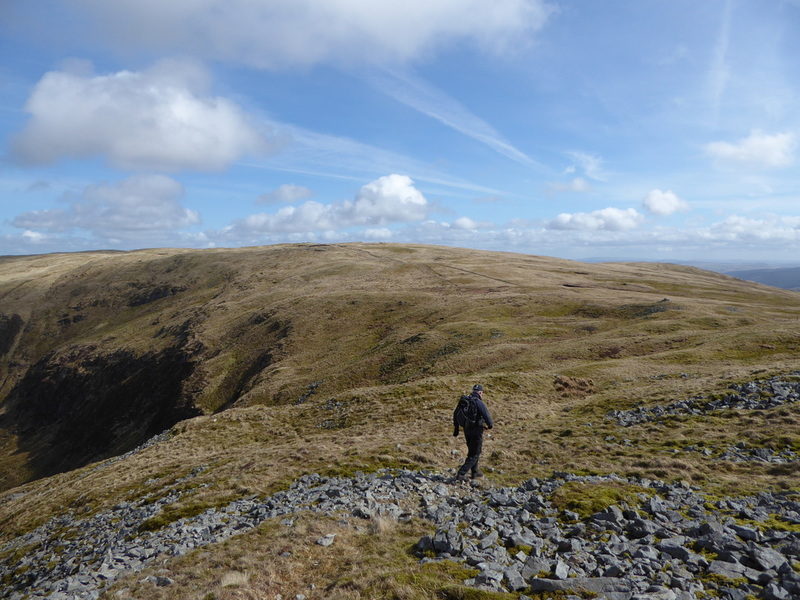 Approaching the summit of Pumlumon Fawr - the ladder stile gives access to the top. 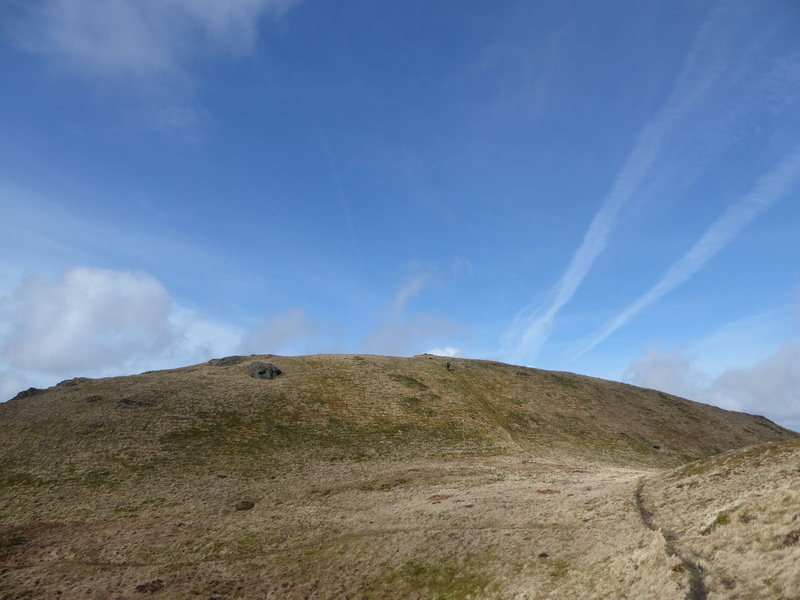 Hopefully that cloud will do one!